Fourth Row Center: Film Writings by Jason Bailey: On DVD: "Thurgood"
Which is not to say that it's some sort of dry, academic slog, even though it is set up to be that very thing. The premise of the piece is that an elderly Marshall (Fishburne) is returning to his alma matter, Howard University, to give a talk on his life and times, and indeed it is structured as a lecture, as "instructor" Marshall peppers his audience with stories, questions, and even occasional praise. He moves quickly from his history to ours; he's talking about the Plessy v. Ferguson case by the nine-minute mark, and begins to weave our shared histories together. "If you want to understand my story," he announces, "don't forget that name: Homer Adolph Plessy." Let it be said, at risk of frightening off the potential viewer, that Thurgood is a tremendously informative program, with much to teach. Marshall walks us through the process of attaining equality in the eyes of the law, step by step, base by case, setback by setback. He talks about his most famous fight, Brown vs. Board of Education, and gives a detailed (and riveting) description of arguing it before the Supreme Court. But equal weight is given to important cases along the way that we may be less familiar with (this writer, for one, was clearly not as aware of Smith vs. Allright as I should have been--blame it on a public school education, I guess). But this is not mere discourse. Fishburne's Marshall is an entertainer, a raconteur, filled with earthy humor and inventive ad-libs (he handles a pair of late arrivals brilliantly, and the punch line to his Richard Nixon story is, by itself, worth the price of the disc). It takes a bit of time, at the beginning of the evening, to get used to Fishburne's portrayal of Marshall's advanced age; he, too, seems not quite comfortable with it (the later scenes of older Marshall are more convincing; he's had time to age into them). But he loses much of the age as he goes back to his youth--he becomes the younger man, to a great degree. His speech gets quicker and sharper as the stories carry us away, and he gets a good rhythm going. 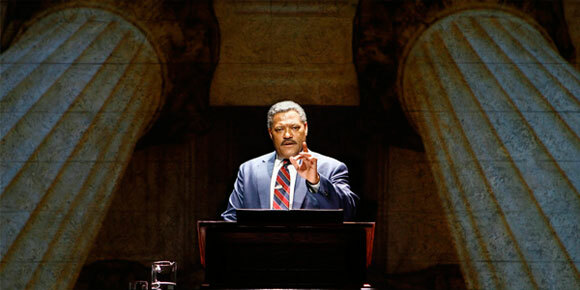 He's a good storyteller, this Thurgood Marshall is, and so, simultaneously, is Laurence Fishburne. It's a bravura performance. Thurgood's filmed performance is directed by Michael Stevens (the script was written by his father, George Stevens Jr., and, well, you may have heard of his father), and you can seem him trying to keep the image dynamic. To avoid the stodginess of a "movie of a play," he might cut a bit too much and move the camera a bit more than is strictly necessary. But it's not distracting, and he nicely interweaves the photos and footage that appear on the giant screen behind Fishburne. Most importantly, though, he focuses on his riveting star, keeping the camera close and capturing every lucid turn. "I have to tell you," his Thurgood tells us, towards the end of the evening, "sometimes I get a little weary of trying to save the white man's soul." He says it with a little glimmer in his eye, equal parts humor and bitterness. There's a lot about the man in a moment like that, and Thurgood is filled with those moments. "Thurgood" is out today on DVD and Blu-ray. For full A/V and bonus feature details, read this review on DVD Talk.